In doing so, web design services use what are known as micro-mini interactions to develop the microinteractions necessary so audiences can use an app or web page in effective ways. How Are Micro-Mini Interactions Defined? In the simplest definition, micro-mini interactions in web design are small interactions that make a microinteraction when combined. Users complete hundreds of micro-mini interactions every day whenever they use an application or website on their phones, tablets, computers, and even while using other electronics like home appliances. Examples of micro-mini interactions that web designers plan out when developing websites and apps include clicking a button on an app so it performs a function or turning on a specific device setting to give that device certain functionality. In these cases, the small end functions are the microinteractions; the action taken to achieve that function is the mini-micro interaction. How Do Micro-Mini Interactions Help Web Design? Well planned micro-mini interactions help a website reach its goals. As small and insignificant as these tiny actions may seem, unless web design services can optimize these small actions to provide a functional and user-friendly experience, applications and sites are inefficient. A simple adjustment in a mini-micro interaction can increase the ease and speed at which a microinteraction can happen, making the app or web design easier for use by viewers. A detail as small as the position, size, or color of a button can change the whole way a site performs. So micro-mini interactions are important base-level considerations that designers must focus on to be certain their designs function as desired to get the anticipated results. How do Web Designers Analyze and Optimize Micro-Mini Interactions? When planning effective micro-mini interactions to build effective microinteractions, web designers must focus on understanding their audiences, how viewers use apps and websites and how to get them to interact in necessary ways. 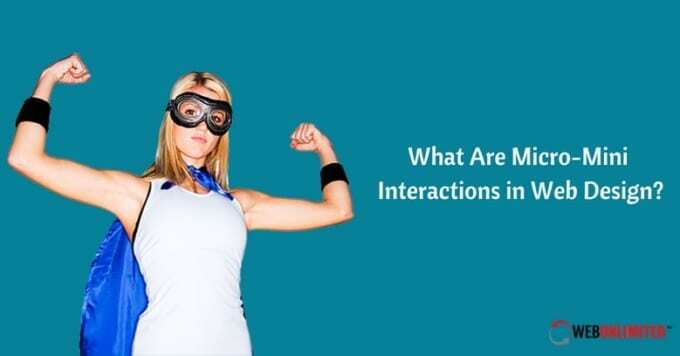 Optimizing these tiny interactions involves first analyzing consumer trends to learn what interests audiences, then providing necessary interesting and entertaining interactons to compete. Web design services can then apply the types of micro-mini interactions for maximum understanding and response. Micro-interactions must also provide feedback to the user confirming that the action taken was successful. Rollovers, simple animations, color changes, and other effects achieve all of these things, encouraging engagement while validating the actions that have been taken. Using inviting micro-interactions that are easily confirmed through feedback to the users, more significant microinteractions can be accomplished by users that help them use the app or website. Since every web design functions through many microinteractions taken by the user, web designers must develop those microinteractions by carefully planning the involved mini-micro interactions. When web design services consider user function from the viewpoint of these very basic interactions, apps and websites will be more user-friendly and effective! Need Professional Web Designers in College Station? Contact Web Unlimited For The Web Design Services You Need!